The Insurance Agent Talent Screen (IATS) report is a specialist assessment for use in the recruitment of insurance agents. Used to assess the sales and performance potential, the accurate and easy to use online test enables quick screening of applicants for all insurance sales roles throughout the business. By assessing motivations, optimism, dependability, social and emotional styles, this fully updated, powerful tool identifies which candidates have the greatest potential for success in the role, and provides prompt questions for a deeper understanding at interview stage. The test takes just a few minutes to complete before producing an easy-to-read report, which serves as a comprehensive guide on who to employ, and how to develop the right behaviours and improve performance. Trait Online and its many reports is the result of extensive research and development led by Professor Stephen A. Woods, leading authority on personality, and a renowned team of work psychologists at Aston Business Assessments. As a result of extensive evaluations on people in the workplace of many professionals across industry, our research has demonstrated that Trait is reliably accurate in predicting performance and effectiveness. In our scientific studies and real-world use of the tool, we have shown the value that Trait can bring to those supporting development, appraising and training. Case studies, testimonials and statistics can be provided on request. 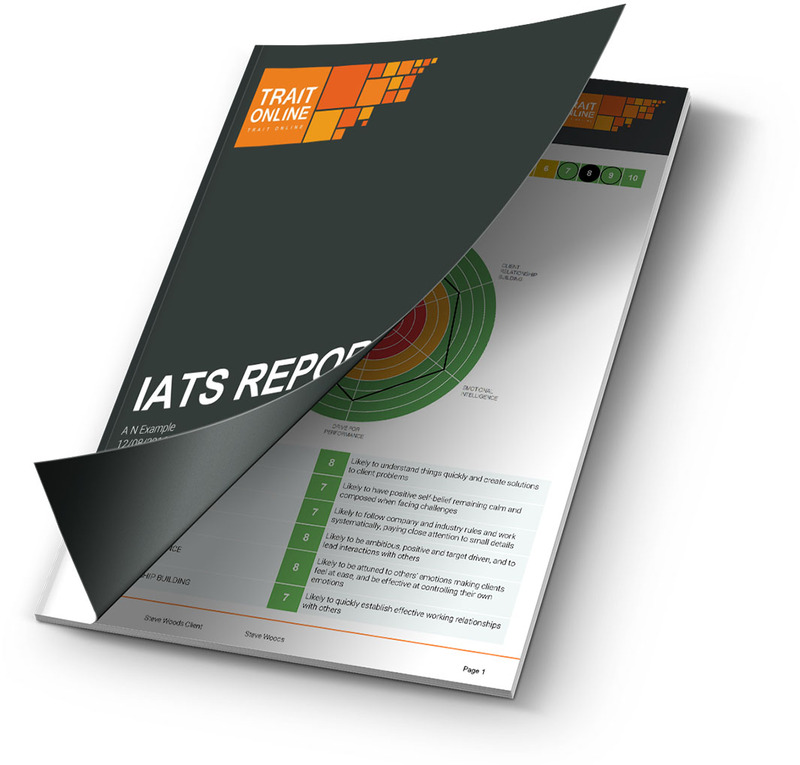 Designed by science for business, the IATS report provides insights into key areas of personality, behaviour and performance style required for the insurance sales industry. With interview prompt questions and summary development plans for on-boarding staff, employers will have the data they need at their fingertips for fast and accurate decision making. Both the test and reports are concise, succinct and relevant to the person you are assessing and the role involved, clearly explaining the results with diagrams, graphs and competency scores to enable you to compare and gauge results. The online test takes just 10-15 minutes to complete, after which you can instantly download or email easy-to-read reports, which can be accessed at any time, from anywhere. Trait Online is subscription based, to give you unlimited access to reports throughout the year. You simply choose your preferred subscription level and pay one fee upfront using your preferred payment method. Ready to use and easy to navigate from day one, assessments, data and reports are customized to your requirements, and quick to set up, navigate and download. With ten comprehensive reports that draw on 13 key personality traits, the Big Five personality structure, and crucial job competencies, our online psychometric products will give you the power to make confident decisions about who to employ and how to develop your workforce.